Chiropractic First chain has 11 clinics in Singapore, including one within Plaza Singapura (68 Orchard Road). 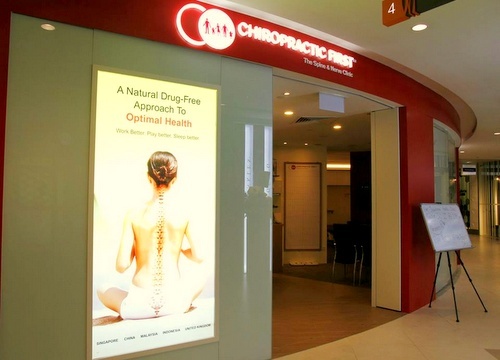 Established in 2000 in Malaysia and today headquartered in Singapore, Chiropractic First is one of the largest chiropractic chains in Asia, operating across Singapore, China, Malaysia, and Indonesia. The company operates with a dedicated team of doctors and wellness experts, each dedicated to educating patients and transforming their lives, helping them to achieve optimal health through chiropractic treatments. To learn more about the benefits of chiropractic care and to make an appointment online with the company, you can use their official website, located at www.chiropractic-first.org. The official Facebook page for Chiropractic Firsts in Singapore is available at www.facebook.com/ChiropracticFirstSG. Following the Facebook page, you’ll receive wellness tips, updates about Chiropractic First events & promotions, and other news related to the outlets in Singapore.